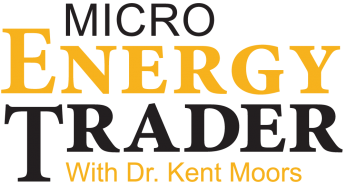 For years, Dr. Kent Moors has been compiling a detailed dossier of micro energy stocks that he didn't share with anyone – not even with members of his elite energy research service. The stocks in Kent's dossier were very thinly traded stocks that could take off like a rocket overnight simply on rumors. These companies were almost all tiny, usually trading at less than $1 a share. And their market caps were miniscule – sometimes less than $100 million. That means they were just too small for Kent to recommend to everyone in his entire readership. The stocks just weren't liquid enough, even though profit potential was enormous. So we came up with a compromise that would allow Kent's readers to get in on these phenomenal shares, names of small companies that could jump 100%, 200%, sometimes even 400% or more. And 18 times since Kent's first alert. In fact, so far this year, they've already had a chance to lock in 20 triple- or double-digit winners, and they're sitting on open gains that have gone as high as 95%, 145%, and 238%. 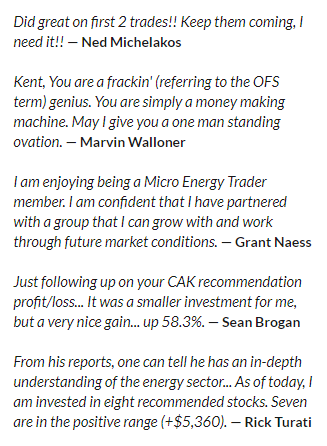 Three years later, less than 1,000 people in the world can access Kent's dossier of micro-cap recommendations. And new members can only be added as existing slots become available. That doesn't happen very often. But you have the rare opportunity today to secure one of these lucrative spots for yourself. Here's my point: Even if you missed nine out of 10, you still would've ended up with a sizable pile of cash. 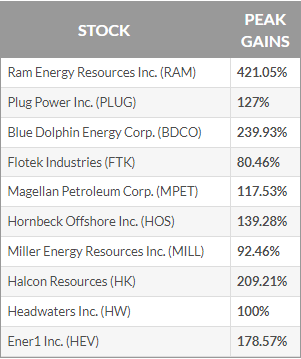 But experienced energy players who know what they're doing can make incredible money on stocks like these. Like hedge fund traders, small-cap energy players don't need a very high percentage of winners to outperform the market by a sizable amount. And now, for the first time, you'll know exactly which ones are most likely to soar.